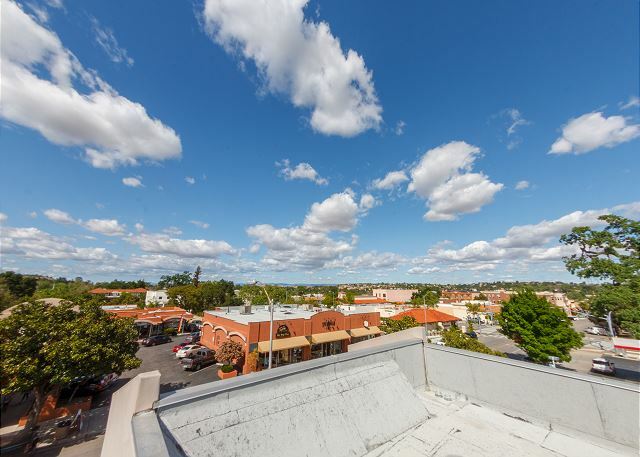 Chic, new, upstairs condo with private courtyard and rooftop patio makes more than a fun rental in Paso Robles. It is surprisingly roomy and can easily accommodate six guests in comfort and style. 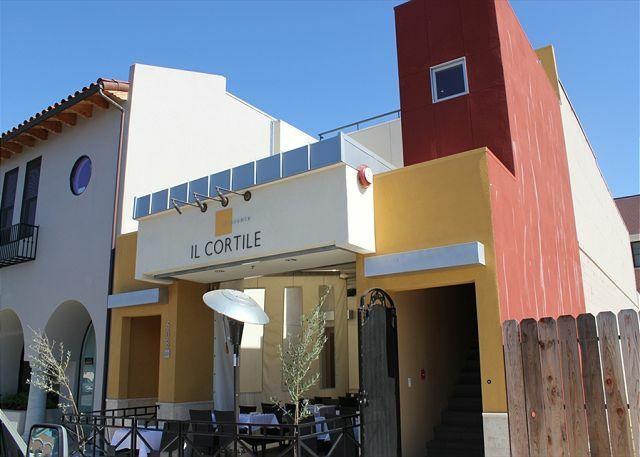 You will find Downtown Paso Robles living, above the acclaimed Il Cortile Restaurant, popular with locals and visitors, and bustling on weekends, particularly. (Closes at 11:00 p.m. weekends.) Two master bedroom suites plus comfy sleeper sofa in the living area. This is the perfect hideaway for a romantic weekend, or for a small group of friends looking to explore the Central Coast and the downtown wine-tasting rooms! Leather furnishings, full kitchen, colorful interior with great attention to detail. Very private, yet with easy access to all Paso Robles has to offer! Parking is available out front, but not designated. Paso Robles Vacation Rentals® is your local expert! Please contact us with questions about restaurants, wineries and fun things to do on the central coast! Great property/location, but . . . Perfect place to stay in Paso! This was our second stay @ MoonSpinners. LOACTION! Right next to the main square and near all of the amazing restaurants. Cons: The vent system from the restaurant under the condo is *extremely* noisy. The vibration from the motor causes the whole condo to vibrate a little. This is evident by the dishes constantly rattling in the kitchen cabinets and the picture frames vibrating against the walls. Upside, the vent is shut off sometime after closing ~midnight or so. I won't echo the other reviews. Everything in them is true. The location is fantastic, the rooftop patio is great in the afternoon, the layout of the property is perfect for two couples. The towels are as bad as everyone has said. Plan to bring your own. There is not one frying pan at property. We were forced to use a soup pot to make bacon at breakfast. The front bedroom's bathroom is missing a substantial pull down shade that would offer complete privacy. Because it is missing, people standing in the kitchen can see directly into the bathroom, affording little privacy. All this said, it really is a great property. With a few small touches, this would be a phenomenal place to stay. First things first, fantastic location and generally in great shape. I'd say the price to value is pretty much on point. While the info I'll put below is going to have some items that could be improved, nothing is in the way of us returning. - Exhaust Fan - by far the worst part of the experience. The fan literally shakes the kitchen cabinets and contents. It does shut off pretty late. The restaurant is closed on Tuesday, so you get some reprieve, which only serves to remind you how bad it is. The front bedroom is generally not affected by it as bad as the back. In addition, it appears there's going to be some pretty heavy construction to the right of the unit, which could only expand the noise. - Towels - they're rough, but they're not significantly horrid like I expected. Some better linens in general could really help the place out. Pillows - they could stand to be replaced. The back room pillows had a weird odor. Lovely place, great location! Nicely decorated, large rooms. Our one complaint was the internet service. It was virtually non-existent! When I emailed to complain and ask someone to come in and see what the problem was, I heard nothing. No email, phone call, nothing. The manager called a day prior to our arrival to advise that we could access the property early (2pm vs 3pm) which was very thoughtful of them. We found the property as described, in very good condition and impeccably clean. The kitchen was very well equipped and the bedding, towels and furnishings were in good condition. The property is situated above a very popular restaurant but, almost surprisingly, no odors were apparent at anytime during our three night stay. The restaurant ventilation system does make a humming noise that one doesn't really notice until it goes off. Otherwise it acts as white noise. For two parties sharing expenses this is not only an exceptional place to stay, it is a tremendous value. We had a wonderful long weekend in Paso Robles! It started with this great condo which was excellently decorated and well stocked with all we needed. The location is very convenient. We were within a block of the downtown with many dining options and shopping. We really enjoyed the rooftop patio to enjoy the wonderful evenings. The staff was very helpful and offered us lots of information about the area and took excellent care of us at the condo. We would come back in a heartbeat! And plan to visit again as soon as we can. Thank you for a great weekend! Extremely pleasant. Definitely would do again! This is a beautiful, spacious condo. Front bedroom is very large, but got a little noise in the evening from the restaurant. Back bedroom is very quiet. Nice living room area with big screen T.V. Very well stocked if you wanted to cook. Plenty of dishes and glassware. Fun rooftop deck with nice view. Nice little patio as well. Very clean and well kept. Highly recommend. - Anonymous, Westminster, Ca. A great 4th in Paso! Internet connection was very slow, impossible to download movies and play from Netflix that we brought as well as our email accounts on our computers. No DVD Player? Would suggest that a dvd player is added. Il Cortile restaurant below played music pretty loudly during their cleanup every night and their patio furniture is noisy while moving for cleanup. Best Bet for Staying in Paso! !